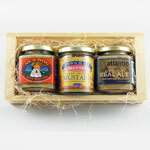 Three popular beer jellies packaged up in a special wooden gift crate. The set includes these fine beer jellies, each made with beer, tastes like beer! 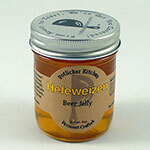 Hefeweizen Beer Jelly. Light and fruity, try this citrusy beer jelly with mild cheese, glazed on shrimp and fish, and whipped into butter. Use to glaze pastries and tarts, serve over ice cream, or spread on toast or top your english muffin! 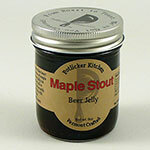 Maple Stout Beer Jelly. Deep and malty, with notes of maple and coffee. Try this beer jelly on toast, in sandwiches, and to caramelize onions. Serve with cheese, on a roast, and to fill chocolate cake. 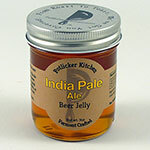 India Pale Ale Beer Jelly. A bit like hoppy honey, try this ale jelly on checken wings, cheese platters, and cured meats. Spread onto a turkey sandwich, an PB&J or toast. A jelly for the beer lover. Ingredients: Beer, cane sugar, citrus pectin. Made in Vermont by Potlicker Kitchen. Refrigerate after opening.